This is fantastic!!! I did alter the recipe slightly. I only used half the ricotta and substituted the other half with 2% cottage cheese. 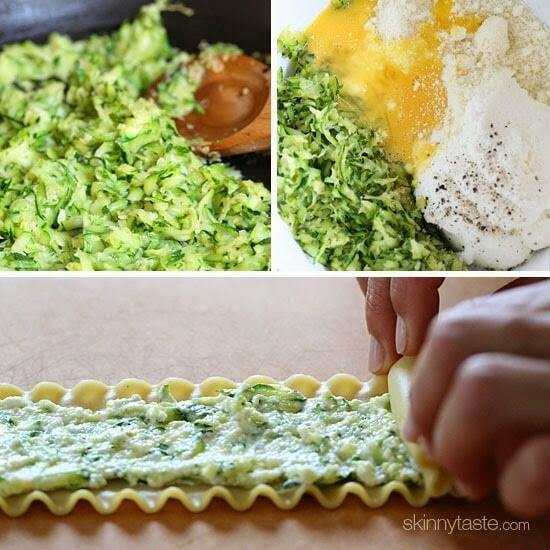 I also added about 1/2 tsp of Italian season and 1/4 tsp of garlic powder to the filling. It is even fantastic re-heated the next day. Love. Love. Love. So good straight from the recipe and So many things you can do with it to change it up! I love using the richer sauces, in my opinion the sauce you choose makes all the difference but I use anything from a vodka Sauce (totally undoes the “healthy” side of this dish) but also use a smile fire roasted tomato & garlic marinara that really kicks it up a notch. 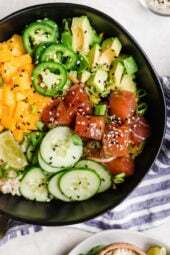 If you Are worried about flavor, just add more garlic or Italian seasonings to you taste but I found the recipe to be Delectable just the way it is. Just made it for the first time with Italian sausage for a heartier meal option. Just browned the sausage then put it in the stuffing mixture. I normally get about 11 rolls from one recipe. Even using 8ox of Italian sausage and full whole milk ricotta, it was jus 283 cal/roll! (If making 11 rolls, like I normally get)Thanks for a great lighter option!! Seriously, I would give this recipe ten stars if I could! I’ve never rated a recipe before, but we make this one so often that it only seems fair. It’s our no-fail, weeknight standby. Easy to make ahead and freezes beautifully. Thanks for all the wonderful recipes; we have recommended skinnytaste to so many people!! Has anyone figured out how many cups two medium zucchini yields? Since I have various sizes of zucchini it would be helpful to know how many cups of grated zucchini two medium yield. Thanks! I made this for dinner tonight. another amazing meal from skinnytaste!! I’ve been hooked for years and my husband thinks you’re a genius – loves everything I’ve made. Even finally made one of your desserts for him – banana pudding cups and he fell even further in love. Also am addicted to your meal plans. Please keep providing these – inlok forward to getting them every Sunday in my email! I made this for dinner yesterday and it was a big hit! Really delicious. So good that the 2 of us ate 4 apiece. Next time I’ll make a salad or veggies so it will last for 2 meals. Love these! My 9-year-old daughter and I had fun making them together, and we all loved them! Next time, I may 1.5/double the recipe since everyone had seconds and I had no leftovers for lunches :). Thank you! 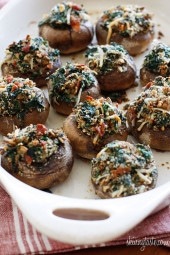 I made these for dinner last night and they were SOOOO good! My family enjoyed them as well. After seeing some comments about them not having enough flavor, I added extra garlic, some garlic powder and went heavy on the oregano. I had leftovers for lunch and they were equally delicious! I’ll be making this recipe again…and again. Thanks, Gina! 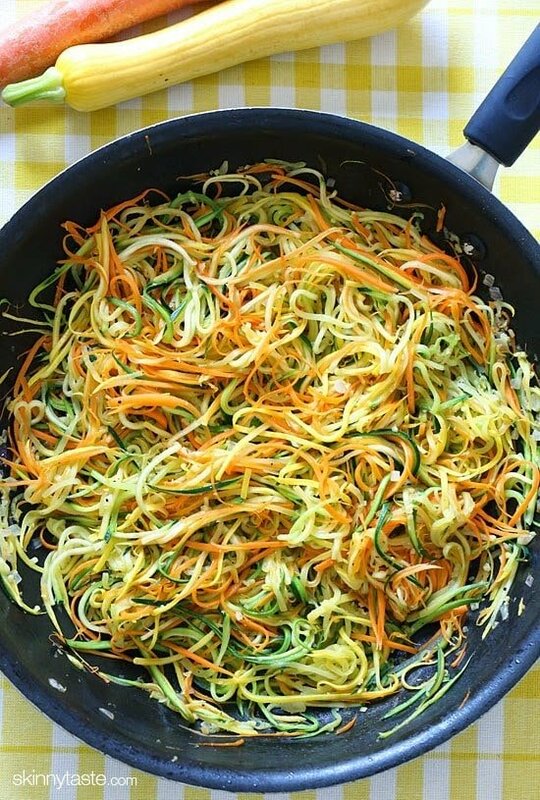 I don’t have a spiral thingy; could you just shred the zucchini? 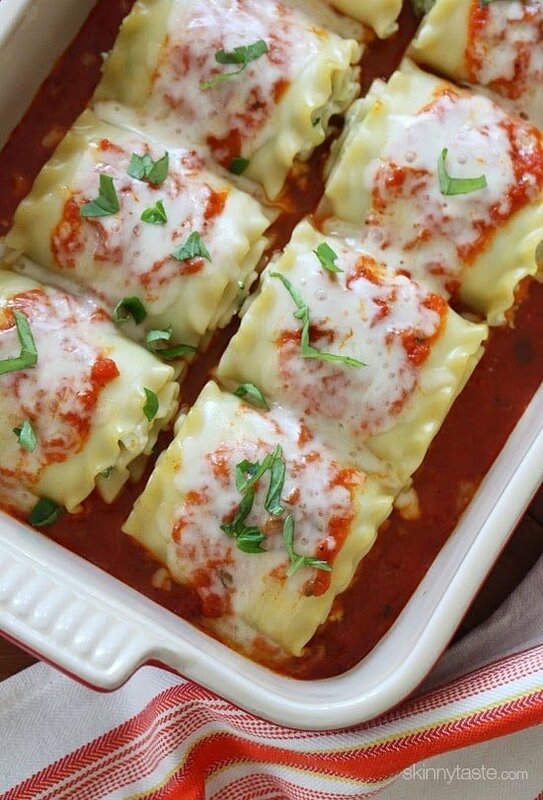 This is so easy and delicious.I made mine with homemade sauce. Are these noodles available in the UK? Flavorful and not heavy tasting. Thank you! I haven’t eaten lasagna in 5 years or more! I was wondering if anyone had every made this filling and put it in a jumbo shell? 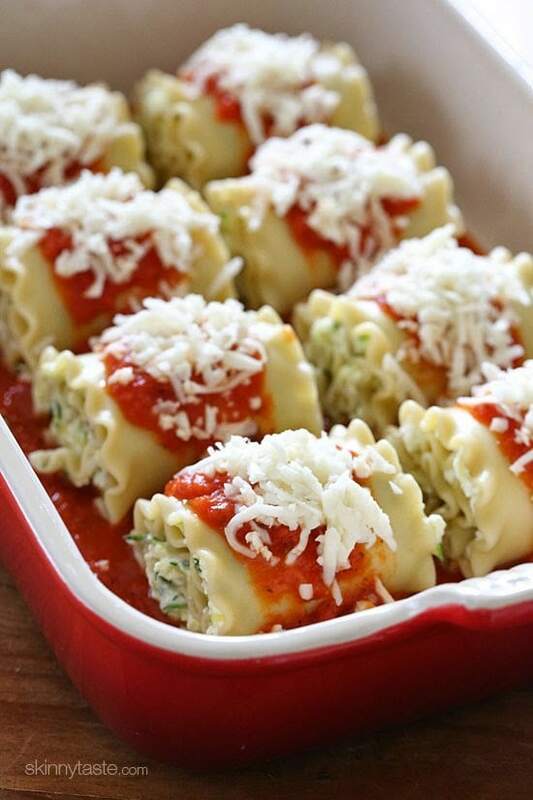 Or in a manicotti shell? Any thoughts? Hey that’s a good idea. I’ve got a half a package of jumbo shells in my pantry i’ve been wanting to use up. I think it would work great! 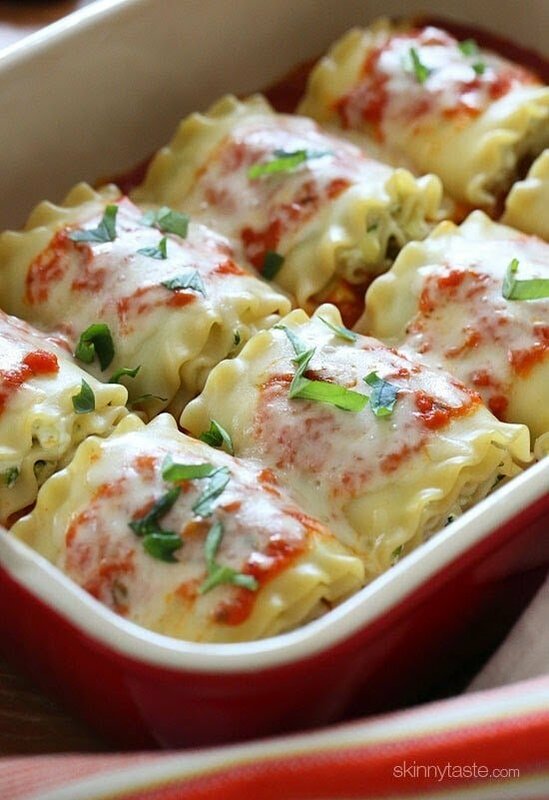 What’s the secret to cooking the lasagna noodles without them breaking? Tried to cook them a day ahead. After carefully putting them in the boiling water one by one, almost all had broken by the end of the cooking time. Can I buy pre-cooked ones? If you plan to freeze this meal and cook it later, how do you recommend going about that? Thanks! For the past several summers, we make a huge batch of these rolls when we have a ton of zucchini and freeze them on a cookie sheet at the point in the recipe before adding the sauce. Once frozen, I throw them in a ziplock bag and pull them out, thaw, add sauce, and bake as directed. Works great and I love having easy meals on hand later in the year! Great question, I wonder too. My fam is meat lovers ???? We are a meat-loving family too and add browned Italian sausage to the ricotta mixture…yum! This is one of our favorite recipes! I”m sure you could add anything you like to the filling. 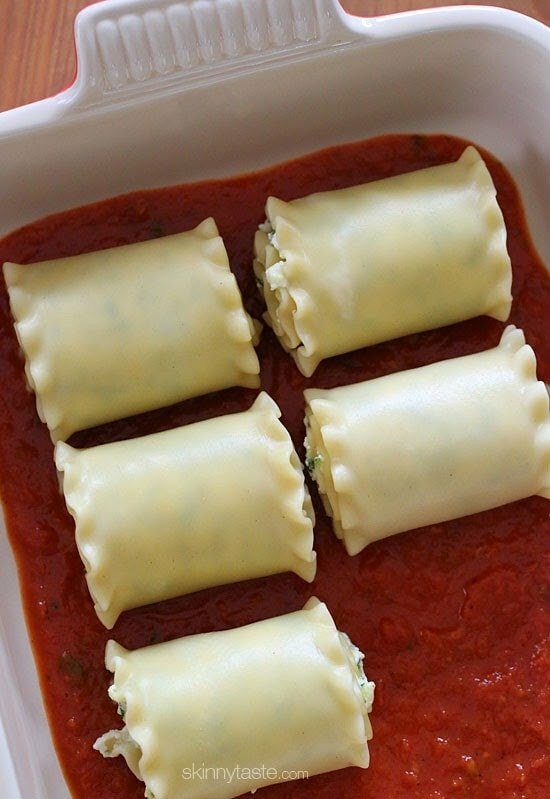 You could do a ground beef and sauce filling like you would normally for lasagna and put a layer of the ricotta and a layer of the meat mixture, or make a meat sauce to act as the marinara. I think it’s a beautiful blank slate. These were really good! 2nd time making them in 2weeks. Ignore the first comment! Made them exactly like the recipe. Loved them! Thanks! I made this last night with the help of my husband. They were absolutely delicious and looked exactly like the picture. Thanks for all the zucchini recipes. I have saved at least a dozen of them. Oh my word these are Amazing! I saw a comment that they had no taste. I’m shocked! Maybe didn’t use a good sauce? My husband and I couldn’t get enough. We fought over the leftovers. Delicious! I agree. I have made these and we really enjoyed them. 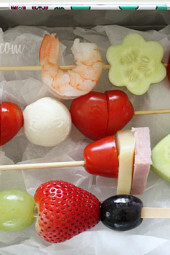 In fact I am making them today or tomorrow!! Hi Gina! My family LOVES this recipe – we’ve been using it for at least a year now. My question for you is, you say you can make it a day ahead. Does that mean fully cooked? Or can you make the filling and roll them and not cook them but refrigerate overnight? I wanted to prep them the day before I bake them but not have to fully freeze them. Thank you!!! I would fill them and have them ready a day ahead but make sure the pasta doesn’t dry out. Hi Gina! How do you reheat the individual (already cooked) rolls?? Cover with foil in the oven at 350 or you can microwave. I made these lasagna rolls , last night , I am italian and I know how to cook italian food .I love trying out new recipes . 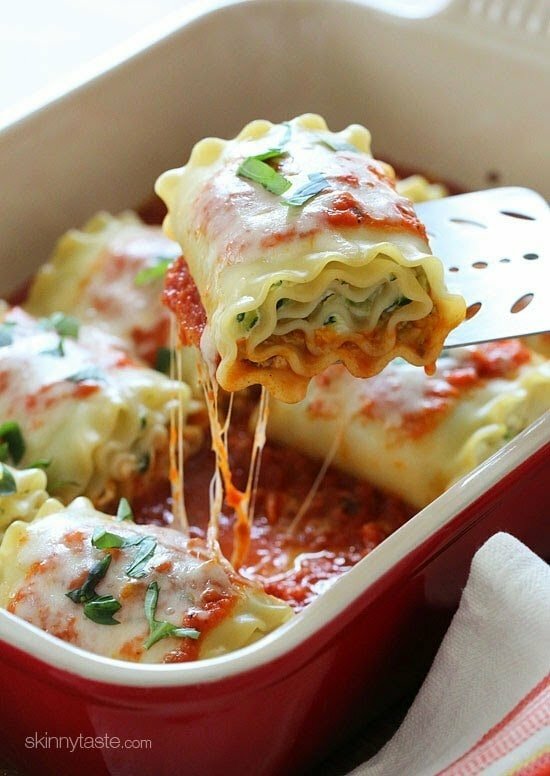 I was very excited about making these lasagna rolls , had fun making them and I thought they would be delicious . I was very disappointed !!!!! they had NO TASTE!!! very bad .my kids didn’t like them either . I had to throw them out . I will never make these again . I hate waisting food , so I was very upset . I would no recommend these to anybody !!!!! I made them and I thought they were great. I’m sure if you’re used to full fat cheese and lots of it and lots of oil, then this recipe may seem somewhat bland in comparison. It takes a while to readjust your taste to lighter food. 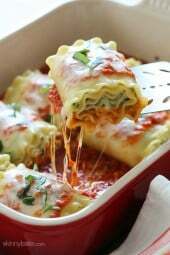 You could easily adapt this technique of rolling lasagna noodles to add whatever ingredients you feel would up the flavour for your tastes. Give it a try!